Growing oregano indoors allows you to have a ready supply of this culinary herb year-round. Oregano is a shrubby perennial. This tender herb grows in a bushy mound of oval, green leaves. Tall clusters of lavender-to-purple flowers will appear in summer. Unless you plan to use the flowers for decoration, pinch them off as soon as you see them. By using the plant's energy for blooming, the oregano leaves will begin to lose their flavor. The two most common varieties are common oregano (O. vulgare) and Greek oregano (O. vulgare hirtum). Common oregano is often rather bland. If you're growing oregano for cooking, you'll want Greek oregano. It has a zestier flavor and a much more pungent aroma. It looks like common oregano except for its white flowers. Don't know how to grow oregano? It's easy. Native to the Mediterranean coast, Oregano can be found growing wild along the rocky coastline of the Mediterranean Sea. Give it plenty of sunshine and sandy soil and growing oregano in your kitchen is a breeze. For cooking: Fresh or dried -- oregano leaves are essential for tomato-based pasta and pizza sauces. Oregano's robust flavor also complements hearty chicken dishes, and adds zest to soups, veggies, and salads. You may find oregano for sale as wild marjoram or pot marjoram. I highly recommend Greek oregano for cooking. For display: Ornamental varieties have little flavor, but add color and contrast among other plants. 'Aureum' has a creeping habit with bronze foliage that will spill over the side of a container. Some ornamental varieties include: 'Jim Best' with green leaves splashed with gold, and 'Silver Anniversary' with a low-growing habit and green and white variegated leaves. For crafting: Dry bunches of flowering oregano and combine them with other herbs and flowers in dried arrangements. If you think oregano is just for pizza, you should know that there are many health benefits of oregano. This herb contains a big helping of carvacrol -- a natural antiviral and expectorant. It's effective as a tea for soothing stomach aches and as an inhalant for treating upper-respiratory congestion. When added to a bath, oregano helps to reduce muscle aches. How to harvest oregano: You can harvest leaves anytime when the plant reaches 6 in (15 cm) tall. Cut stems off, leaving at least 2 inches of growth above the soil. Even if you just want the leaves, cut the whole stem before stripping away the leaves. Harvesting oregano tip: Pick oregano leaves early in the morning to get their best flavor and fragrance. That's when their oil concentration is strongest. You'll also get the best flavor by harvesting leaves before the plant starts to flower. Drying oregano: This is one of the few herbs that keeps its flavor after it is dried. Here's how to dry oregano: Cut off stems and tie in 1 inch bunches with string, leaving a loop for hanging. Hang them upside down and allow them to dry naturally in a dry, dark place. Want to dry them in a hurry? Microwave them. Place several sprigs on a paper towel, cover with another paper towel and microwave at full power for about 2 minutes. Light: Bright light to full sun. Give oregano at least 6 hours of direct sun per day. 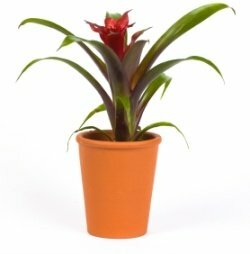 Turn plant for even growth because it will tend to grow toward the light source. If growing oregano under fluorescent light, keep the light 6 in (15 cm) above the plant and leave it on for 14 hours a day. This is the equivalent of 6 hours of sun. 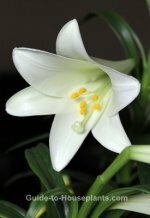 You can move your plant outdoors for the summer, just be sure to bring it back indoors before the first frost. Water: Keep soil evenly moist. 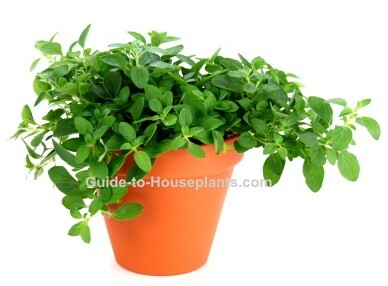 Oregano plant is easily killed by overwatering, so use a container with a drainage hole. Young plants should be kept moist, but oregano is drought-tolerant once established. Soil: Plant in sandy, well-drained soil to prevent root rot. Mix 1 part all-purpose potting mix with 1 part sharp sand. Or you can use cactus potting mix. Propagation: Seeds, division or stem cuttings. Growing oregano from seed often gets unpredictable results. The new plants may not be anything like the parent plant. Your best bet is to buy oregano seeds or plants and plant them one per pot. Their shallow, creeping roots spread quickly, giving you new plants. Divide 2- to 3- year-old plants in spring and pot them up separately. Take stem tip cuttings in spring.